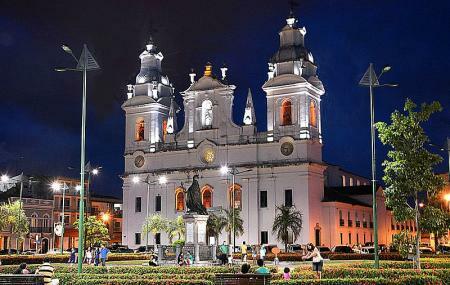 Find hotel near Catedral Metropolitana De .. This 18th century church was completed in 1771 on the site of an earlier church. From the outside, it is a masterpiece of mixed art, combining elements of Baroque, Rococo, and Neo-Classical influences. The towers follow the model of Bologna churches. Inside, the church is lavishly decorated. It has a classic organ, richly adorned wall panels, large paintings of saints on the sides, and beautiful frescoes on the ceiling. The cathedral is an important part of the Cirio de Nazaré celebrations, which is one of the world’s largest processions. It is from where the image of Our Lady of Nazareth is taken to the Basilica of Our Lady of Nazareth. How popular is Catedral Metropolitana De Belem? People normally club together Teatro Da Paz and Parque Da Residencia while planning their visit to Catedral Metropolitana De Belem.